This is 180 sq. ft. The Otter Den Tiny House by a small home renovation company called Otter Hollow Design. James Brookshire, the owner, built this tiny cabin with his inspiration from the tiny house movement. This little cabin boasts a sleeping loft, bathroom, sink, kitchenette, and more. Please enjoy and re-share below. Thanks. If you’re in the Atlanta, Georgia area you can consider hiring the help of James for your tiny or small house project. Get in touch with him below if you want to. looks well planned and executed with some very fine details. Nice home, but I think the railing in the loft should be higher. Looks like a good way to trip and get launched into the living room! Good point, Hootie! We actually discussed that when I was putting up the railing. I think I made a very similar comment! However, we have a GORGEOUS view of our pond while sitting in bed that would be obstructed (albeit just a little) by a higher rail. If I was building this for a customer, I would DEFINITELY install a 18″-24″ rail . Why not just raise the bed as much as you raise the railing? Very thoughtfully planned. I love the walkway leading to the home, the stairs and the more ample than usual headroom in the sleeping loft. Ditto, I love all those things and the rustic beauty, the view, and the feeling I would never want to leave. Great job! I love this home–how it is designed inside and out. It is perfect for me with one bed and bath added (stairs are impossible for me) at the livingroom end and make the living room longer. I do believe that if this company would build more like this on individual lots, that they would make a fortune! Just perfect and so adorable. Living smartly and beautifully here! Wow! This is one of the BEST tiny home designs I’ve seen in a long time, and with stairs to the loft too. My biggest bugaboo about the majority of tiny homes out there is the fact that they have ladders instead of stairs, which is neither safe or practical for a lot of us–especially during those middle-of-the-night forays to the bathroom downstairs. Too, the thought of trying to wrestle a double or queen mattress up a ladder gives me the willies, let alone a few knickknacks. This particular design is so thoughtfully and beautifully laid out and just flows from one area to the next. You can bet your sweet patootie I will be keeping my eye on this tiny house company! Lofts are a perfect place for Sleep Number Beds! Also, you can easily slip the mattress up there as soon as the floor is finished, before you put in the stairs/ladder/railings. After all, folks, you’re not lifting it the height of a story in a conventional house; it just goes up a bit over your head! Pretty damn cute, and very well constructed for such a small space….and stairs, thank you very much! Is there a shower, inside or out? Yes, is there a shower? Or stove? Or oven? Since this is a prototype, and meant to be a quest house, I’m sure it can be reconfigured to add a stove and shower, if you wanted to make it a more permanent home. I just love the location! I read somewhere that they are going to build on a shower, but I don’t remember where I saw that either! Thanks for the comments! As noted, this build was based strictly around our needs. The flexibility of the design would allow much more storage, if needed, and room for a proper kitchenette. We do intend on adding an outside shower. 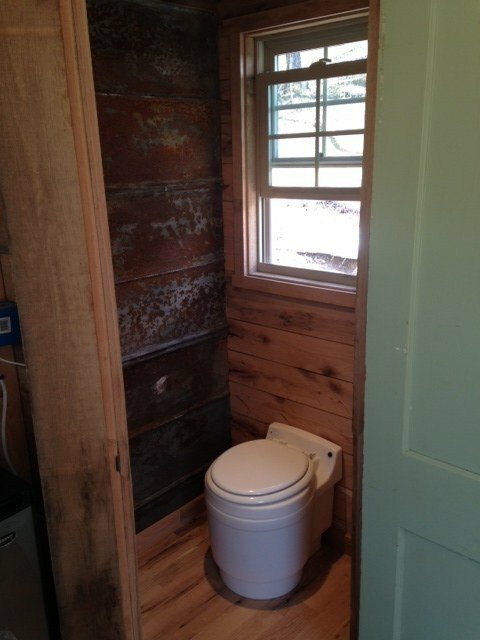 There will be a door to the left (facing) wall in the bathroom. You will step right into the shower stall, which will have a tin surround like the rest of the house. Our climate allows for use of an outdoor shower on all but the coldest of days (lucky us!). It would be fairly easy to put a small shower inside the house, as well, but was just not something that we needed. We really wanted an open feel…which is hard with so little space! We accomplished what we wanted, but also understand that if it were used as a full-time residence that some of that openness would have to be sacrificed. I have sketched out some pretty cool ideas for adding more storage and kitchen space without altering the shell. One thing I didn’t take a pic of is the generous enclosed crawl space that building on a sloped lot allowed us. I will update my site with some more detailed pics in the future. Thanks, again, for all the great comments and ideas! I’ve started a notebook of my favorite tiny houses and this one will definitely be added. I ADORE IT!!! I WANT IT!!!! GREAT GREAT JOB!!! Double out-swing doors to a very small deck is a bad idea – use a slider. The lack of a guard-rail around the deck will drive your insurance provider crazy. Swing the single “entry” man-door out. A door unto the “crawl-space” might make for some inexpensive useful storage space. Fake shutters are bad enough – but OMG they don’t match the size of the window. Oops! I see that the double swing-doors to the deck actually swing in rather than out. In-swinging doors in this design are even worse than out-swing doors. They consume a lot of floor space, and in this design will run into the furniture. One of the comments mentioned the lack of a heat source. It looks like there is a small heat unit in the corner near the sofa. Yes – the one with the plant sitting on top. I can’t tell if it is “real” or a “simulated” small wood-burning stove. I like the full size doors and big windows and yes, the stairs to the loft. Would want a shower and more of a kitcheny sink (to do dishes) and did I see any kitchen cupboards for dishes/food? It helps knowing it’s a guest cottage to understand why the bathroom and kitchen areas are so minimal. Anyone know who sells that futon/couch? I almost think I used to own one a lot like it that I got at Walmart. I could see a few of these scattered around a 20 acre property in the mountains as a great way for people to try out tiny houses for a weekend. Of course shower and kitchen would be necessary but a very easy addition to this great design. Sweet! This is one of the best looking small lodges I have seen to date here. I appreciate the style, attention to detail, materials used, layout, colors, and overall look. From a builder’s perspective, I may have increase the elevation of the pipe handrail and added a handrail to the deck. Otherwise, this is, from my perspective, a class act. Nice. This one of my top favorites (with a few added necessities like a simple kitchen, shower, storage and laundry area- it’s do-able). It may even beat my all time favorite, The Pinafore. I keep my list of favorite features and houses along with a little secret dream that I may live in one some day…all by myself. Perfection on wheels. scale, utility, loveliness all in one. very nicely done…I love it! This looks to be about 10′ wide, 2′ wider than a typical tiny house on wheels. It looks to be about 12′ long. I like the width, and think it could be a few feet longer yet for full time living. We live in the Atlanta area, and while we don’t want a tiny, tiny house, we want some land and a house built with an RV Port for our motor home. We’ve seen some in FL in person, and on line in AZ, NM, etc. They are usually small homes so you have a more permanent place to live and can keep the RV with you when the weather is too bad to travel. Wish someone would start a subdivision in Forsyth County, GA for such homes. I love this home, and the property is beautiful. I would need a one level, but this is great. A classic. Love the fact that it’s on a foundation. People need to petition local, county, and state governments to allow tiny house buildings on land. It’s obvious that government wants the taxes from larger homes, but there has to be a type of small community zoning that would work. I wonder whether the authorities looked the otter way when this was being made. But on the otter hand, it is a nice little place. But there are probably plenty of otter places this abode could have been established. Do they have to haul water up to this tiny den? Or do they have some otter means to get it there? But it must surely be a blissful place to live as all the otter neighbours must be living in lots of otter remote places too. On the otter hand maybe it gets a little too quite and they need someone, or something, to relieve the otter boredom that must inevitably set in. Are there possible options for bathroom w/shower/mini tub, mini kitchen (2 burner stove, microwave/convection? Oh! I love this little house! So cozy and livable. Adorable! I’m generally not a big fan of the all wood look! That changed with seeing this home… it’s beautiful! I love the exterior finishes. The only thing I’d change… make it into THOW dimensions! Great job! What attracts us is attractive (evidently), and often what fascinates is alive art, this reminds me of a phrase by singer Adriano Celentano: ” A life without music is sad, but a music without life is terrible”; so is also the Architecture.